So, lots of great feedback from my presentation on Saturday. Thanks to everyone who attended and for putting up with me. :) Ultimately I think the session was such a success because of the great interaction and awesome people that attended. I really hope you guys picked up some useful information. 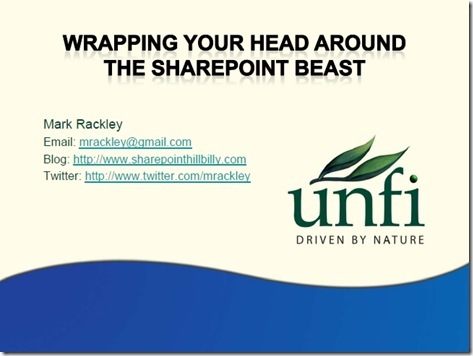 If you weren’t there, I’m trying to develop the presentation that I wish I would have seen when I started SharePoint development. I’ll keep improving upon it and do what I can to make it more cohesive as I go. Please feel free to leave comments about what you liked best or where I can approve. Here are the slides and feel free to hit me up with any questions. The next SharePoint event that I KNOW I’ll be speaking at is SharePoint Saturday Birmingham on November 21st. Hope to see you there! Thanks Mark for the great presentation and the getting the slides up so quickly. I ran through them again and it's just not the same effect as when you are giving the presentation. They really need to video the presentations so people can see what a great job you and all of the other presenters did as #SPSDallas.